Three Buttes Cattle Company is a sportsman’s paradise with Pope and Young deer, and trophy trout in the 1.5 mile stretch of the Sun River that runs through the Ranch. 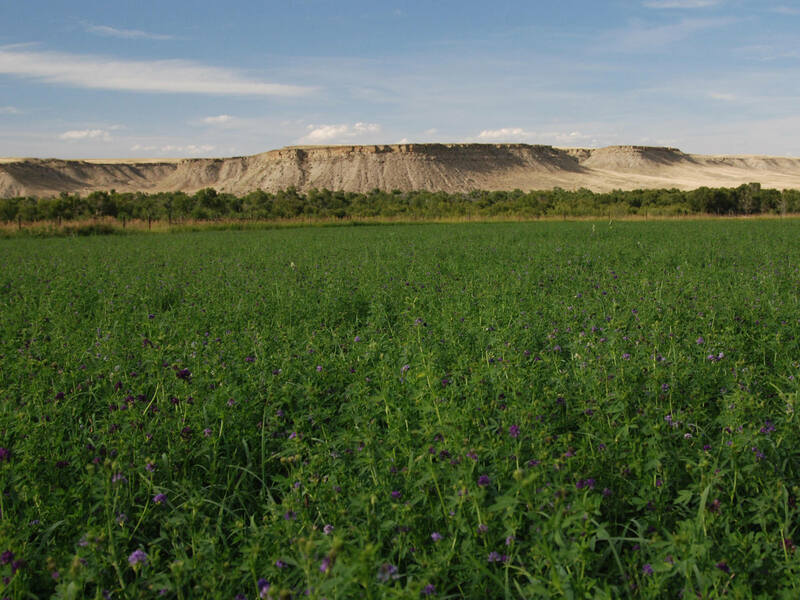 Located four miles west of Simms and about 45 minutes from Great Falls, the 1,237 deeded-acre Ranch embraces native pastures, irrigated alfalfa fields, lush wooded river bottom, big valleys and dramatic views of Floweree, Crown and Shaw Buttes. This part of Montana is an extension of the Rocky Mountain Front, which is often called the ‘Crown of the Continent’ and represents some of the most scenic and dramatic views in the Rocky Mountains. The Ranch has been very well managed for big game, upland birds and waterfowl. Several Pope and Young whitetail and mule deer bucks have been harvested from the Ranch over the years. There is a well-established trail system to access the network of ideally positioned and seasonally adjusted tree stands. There are few opportunities for the avid archery hunter comparable to those on the Three Buttes Cattle Company. 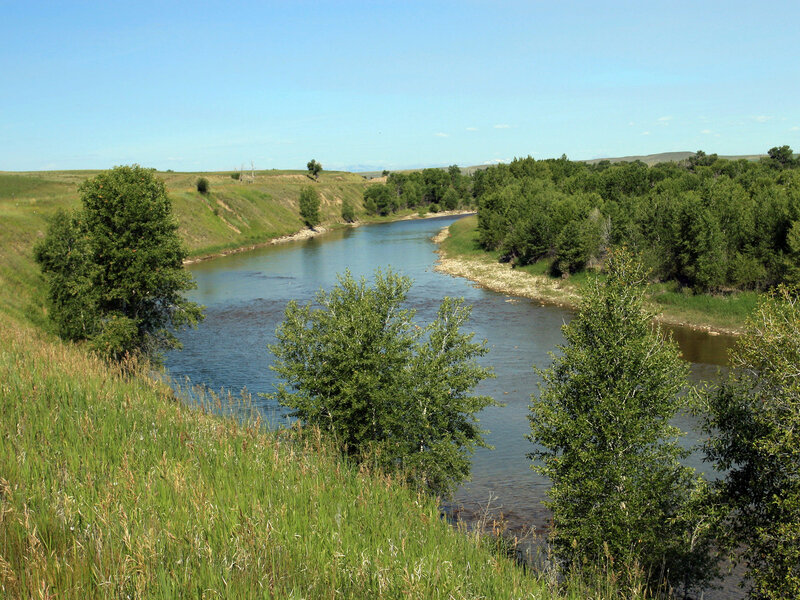 Fishermen can pursue large rainbow and brown trout in the riffles, pools and undercut banks of the Sun River as it flows through the Ranch. A private spring creek also meanders through the riparian area on its way to its confluence with the Sun River, providing an ultimate challenge for a spring-creek fishing aficionado to chase healthy brown trout that have worked their way up from the river. Devoted fishermen will also appreciate that the famed section of the Missouri River and the renowned riverside fishing town of Craig are only 45 minutes away. With the proximity to neighboring irrigated grain fields combined with the river bottom and wetland cover, significant populations of Hungarian partridge, pheasant and sharp-tailed grouse are observed throughout the Ranch. The main residence, an exquisite Phil Korrell-designed and built home, is perfectly sited to offer the unique perspective of both the up-stream and down-stream views of the Sun River corridor. The home, equipped with a custom designed kitchen and a finished wine cellar, is ideal for entertaining or family gatherings. The two-bedroom guest house is perfect for accommodating guests or small groups of hunters. The Ranch is in impeccable operating condition and the new owners could run a small cattle or horse operation, or they could continue to lease the farming and grazing for annual income, while focusing on the impressive fishing, hunting and recreation opportunities the Three Buttes Cattle Company has to offer. 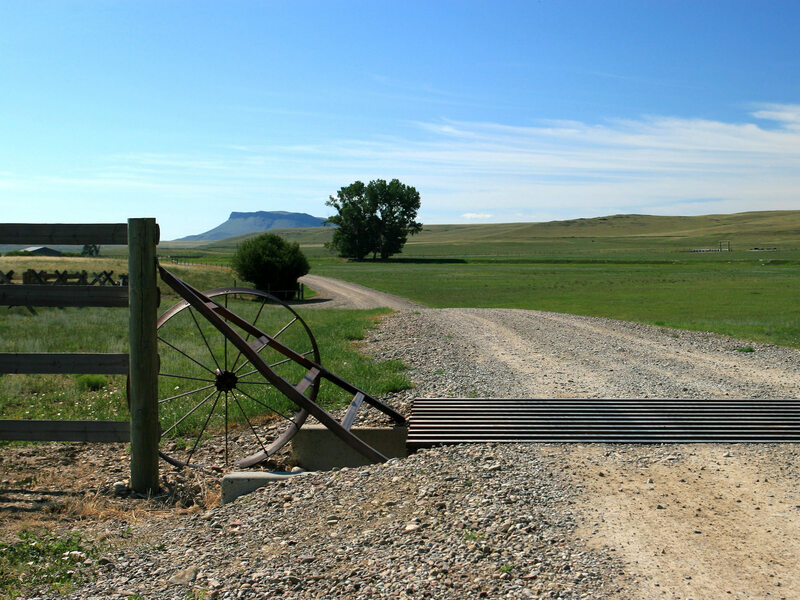 Three Buttes Cattle Company is located 4 miles west of Simms on State Highway 21. Great Falls, the third largest city in Montana, is a comfortable 45-minute drive from the Ranch on paved highways. Driving from Great Falls to the Ranch, take Interstate 15 north to State Highway 200 at Vaughn. Follow Highway 200 west to Simms where the highway divides and bear west on State Highway 21 towards Augusta. 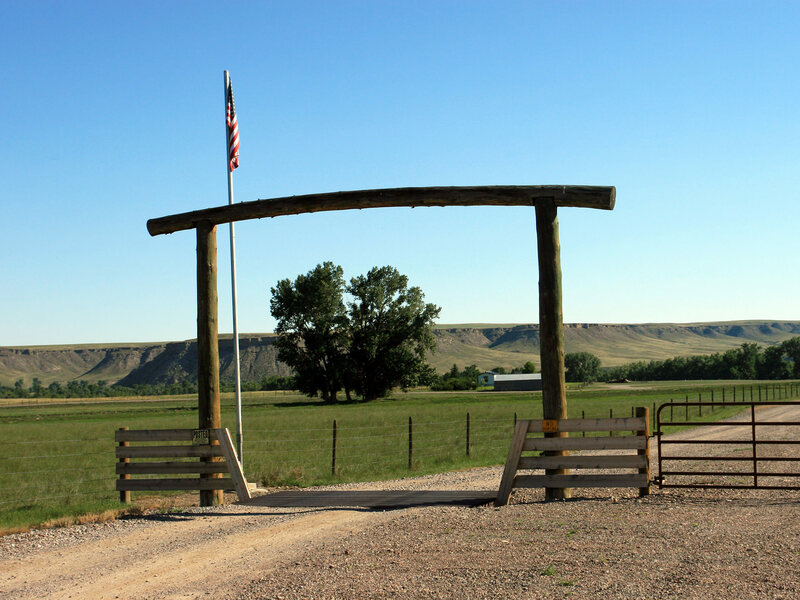 The Ranch entrance is located roughly 4 miles west of Simms on Highway 21. Known in Montana as the “Electric City” due to the series of hydroelectric dams, Great Falls is the commercial and banking hub of north central Montana. With a population of approximately 60,000, Great Falls offers a complete and diverse array of retail, dining, supply and equipment services. The Great Falls Clinic Medical Center also provides quality health care and surgical services. Malmstrom Air Force Base, located just east of Great Falls, is home to the 341st Missile Wing, one of three U.S. Air Force Bases that maintain and operate the Minuteman III intercontinental ballistic missile. Convenient commercial air service is provided at Great Falls International Airport with good connections offered by Delta, Horizon, Northwest, Allegiant Air and Continental Airlines. Currently, direct flights are available to Denver, Las Vegas, Minneapolis, Phoenix, Salt Lake City and Seattle. For up-to-date flight schedules and airport information, please refer to the airport website: http://www.gtfairport.com/. Simms and Augusta offer limited local services which include gas stations, convenience store, post office and cafés – classic Montana ranching towns. Choteau, the Teton County seat, sits about 30 minutes to the north and provides a larger range of services. A well-maintained public airstrip is situated on the northeast edge of Choteau. Located at an elevation of 3,942’, the 75’ x 5,000′ asphalt runway is in good condition. Communications for this facility are available through Salt Lake City at Frequency 133.4/285.4 (Great Falls RCAG). Families can expect their children to receive a high-quality kindergarten through high school education at Simms Public Schools. Students attend from the surrounding community to experience the unique environment of the small-sized multi-grade classrooms. The high school is classified as a Class C school (under 160 students) by the Montana High School Association and provides a great learning environment and competitive interscholastic athletic programs. School bus service provides round-trip transportation for elementary and high school students in the area. The Simms community has traditionally been very supportive of the school system and has historically supported school bonds for capital improvements and upgrades. The local area is primarily comprised of cattle and farming operations and borders the famous Broken O Ranch. Further upstream on the Sun River, land ownership is comprised of recreational and hunting landowners with scattered agricultural operations. Situated about thirty-five miles west of the Ranch are several of the most noted land forms of the Rocky Mountain Front – Castle Reef, Sawtooth Mountain, Gibson Dam and the stunning Sun River Canyon. This majestic panorama of rugged limestone peaks, sheer walls, towering reefs and deeply-cut canyons provides a viewscape like nothing else in North America. 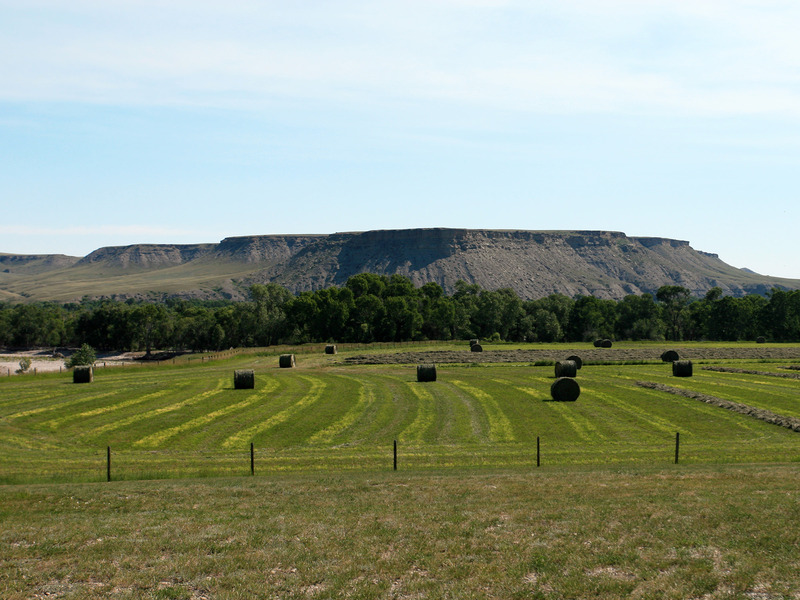 The topography of Three Buttes Cattle Company features a classic western river corridor that transitions to native pasture and eventually into steep bluffs that provide panoramic views of the Ranch below, the Rocky Mountain Front and Crown Butte in the distance. 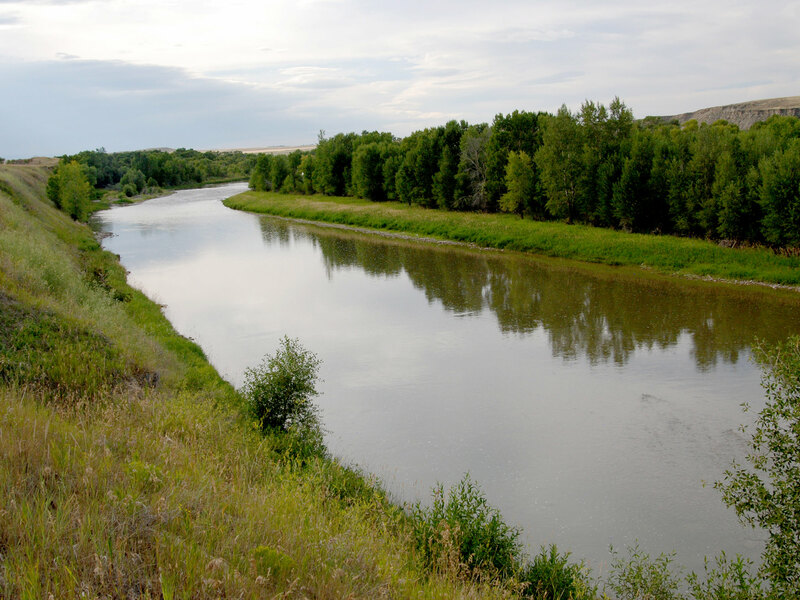 The Sun River is a significant geographical attraction as it flows from west to east through the center of the Ranch providing a significant riparian corridor that features a spring creek and numerous wetlands. The hills and valleys of the Ranch provide a diverse landscape and very captivating views. The Ranch provides an ideal location to run about 75 pair of cattle. According to an assessment conducted on the Ranch in June 2001 by Norman C. Wheeler & Associates, the Ranch is currently rated at 200 Animal Units. The current owner is not running livestock; however there are leases in place for the hay and grazing operation to local operators. Copies of these agricultural leases are available to qualified Buyers upon request. 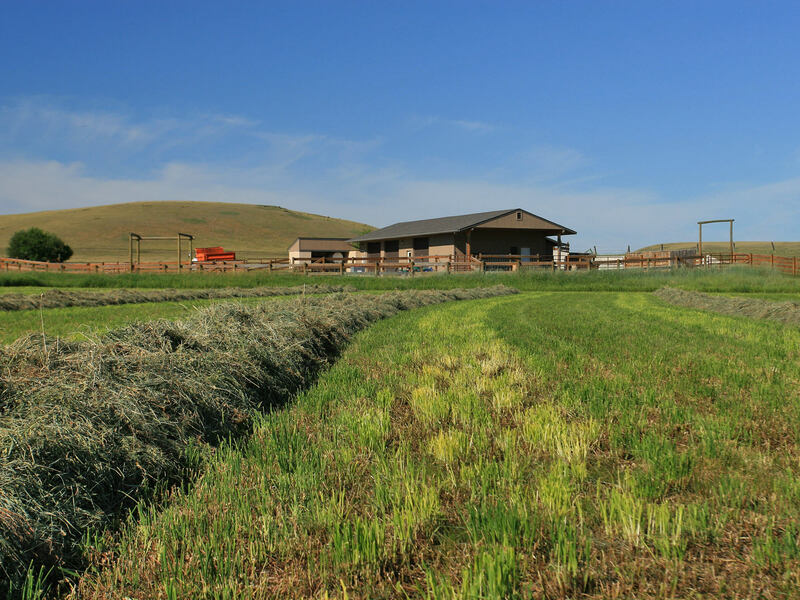 The native pastures are well watered with access to the Fort Shaw canal, Sun River, spring creeks and several wetland springs. The elevation on the Ranch ranges from 3,600 feet on the Sun River to 3,975 feet above sea level. The average annual precipitation is 13 inches. The average growing season of the area is approximately 129 days. The long hours of summer sunshine combined with the majority of the rainfall in May and June provide a favorable climate. Average high temperature in June, July and August ranges from 74° to 83° Fahrenheit. In December, January and February average high temperatures are between 37° and 41°. Summer average minimum temperatures range from 46° to 50°. Winter average minimum temperatures are typically around 16°. There is plenty of sunshine throughout the year. 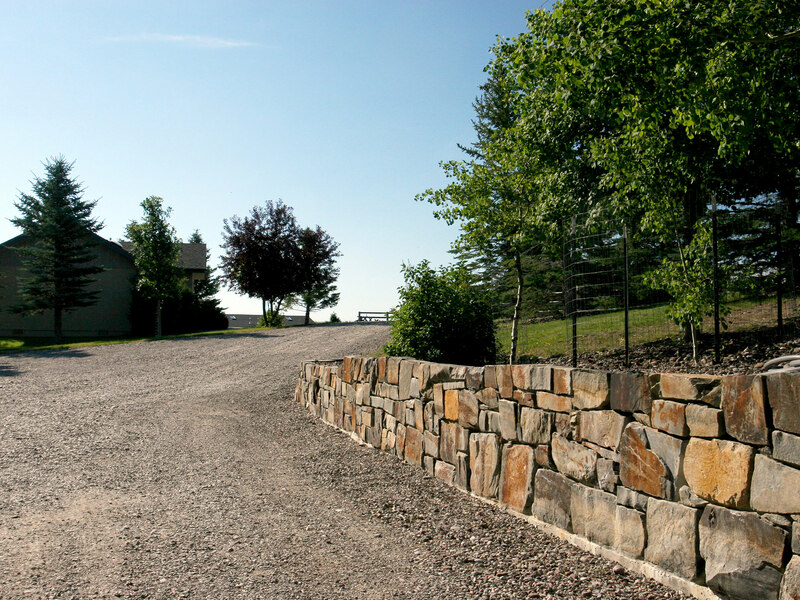 The Owner’s home, was custom designed and built in 1998 by renowned Montana architect, Phil Korrell. It is beautifully sited in a mature landscape of spruce, pine and aspen trees along a high bluff providing enchanting views of the Sun River, the wooded riparian bottom and the cliffs of Floweree Butte. The 4,141 square-foot home consists of 2 bedrooms, 2½ bathrooms and includes a dramatic great room with a large moss-rock fireplace featuring an elegant timber mantle with dovetail joints and a wall of windows to enjoy the panoramic beauty of the Ranch. The powder room features an antique sink and is conveniently located near the spacious mud room, which has very functional furniture benches that are able to be converted into extra beds when required. Affording stunning views of the Sun River, the expansive master suite has cathedral white-washed aspen ceilings, a gas fireplace and includes a private bath and large walk-in closet. The well-designed kitchen is positioned in the center of the home; perfect for entertaining and family events. With double ovens and a 48" Jenn-Air Pro-Style rangetop with a warming drawer, it can easily accommodate several chefs. Just off the kitchen is a formal dining room which enjoys commanding views of the Ranch, and the intimate breakfast nook with built-in padded benches with overhead skylights is ideal for smaller gatherings. An enclosed patio, featuring a wood stove, leads to a wing of the home that includes a private office and a very comforting guest suite with private bath. The home is equipped with a finished wine cellar that has built-in shelves, red-brick ceilings and is temperature controlled to a perfect 59 degrees. There is an extensive well-designed vegetable garden with raised beds and six foot deer-proof fencing. The home has an attached oversized garage which comfortably accommodates two full-size vehicles and has an additional tool room, hunting gear room and loft storage accessible via metal stairs. Across the driveway is a detached equipment garage with a roll-up door that provides convenient access for ATV’s, mowers and an efficient shelving system for additional storage. The owners’ compound is completed with a two bedroom, two bathroom 960 square-foot guest home that is located along the entry to the main home. Attractively furnished, it is perfect for guests or small groups of hunters. The equipment and storage facilities are adequate to serve an operation of this size and scale. There is a heated 1,688 square-foot shop with 220 amp electrical service, concrete flooring and three roll-up doors. The attached room is ideal for reloading ammunition or to utilize as a tack room for the equestrian enthusiast. A complete inventory of the personal property and equipment available via separate Bill of Sale will be provided to well-qualified Prospective Buyers and their agents. A single-wide trailer home on the Ranch, currently occupied by the ranch manager, will be available to be shown to well-qualified Prospective Buyers and their agents. There is also a 1,200 square-foot shop with large sliding doors and metal siding that is conveniently located near the manager’s home. The taxes on the real estate and improvements for 2013 were $13,000.00. Electricity is provided by Sun River Electric Cooperative based in Fairfield. Telephone service is provided via Three Rivers Communications. Domestic water for the homes and corrals is provided by individual wells. All residences are on individual septic systems. Annual electric costs for the improvements, excluding the manager’s home, and stock water wells typically run about $2,000±. The gated-pipe flood irrigation network runs efficiently without any electrical costs. Contact Swan Land Company for more details. The Sellers will convey with the Ranch 100% of whatever mineral, oil, gas, geo-thermal, hydro-carbon and gravel rights it actually owns, subject to reservations by previous owners. The Sellers make no representation as to the quantity or quality of any mineral or other subsurface rights appurtenant to the Ranch. 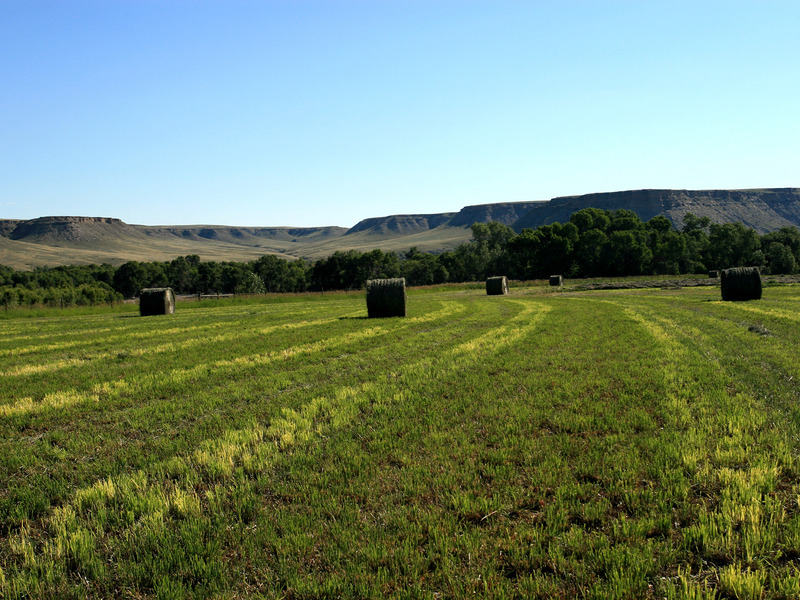 The 1,237 acres of the Ranch were placed into a conservation easement with the Montana Land Reliance in 2001. This easement has no restrictions on agricultural or recreational activities, but limits residential construction to one additional residence on the south side of the Sun River. This easement does not provide any public access to the Ranch and there are no restrictions on building additional buildings to support the agricultural operation. Like many other young adventuresome entrepreneurs in the 1800s, Daniel Floweree left his home in Missouri in 1852 to find his fame and fortune in the gold fields of Montana. After several years of hard luck, he found his fortune in the mining claims around Helena. Young Floweree soon realized the abundant possibilities in the cattle industry in Montana with its vast grassy prairies and plentiful water resources. Floweree trailed 65 head of mother cows from his home state to the grasslands of Montana. On his way through Miles City, he acquired a business partner by the name of Lowry. These two stockmen worked their way west to the Sun River Valley. It was in the early 1870s that these cattlemen purchased 1,500 head from Texas and they made their way north along the renowned Chisholm Trail. Several years later another large herd was purchased from the Oregon Territory and trailed across the Rocky Mountains to the Sun River Valley. The Floweree and Lowry Cattle Company was created and the town of Lowry was established near the western border of the Ranch near the Lowry Bridge. When the Floweree and Lowry Cattle Company was in its prime in the early 1880s, local historians claim that these cowmen were running between 25,000 and 40,000 head of cattle from Wolf Creek to the Canadian border! The town of Simms, surrounded by buttes and benches, was built on a low spot in the Sun River valley, a perfect place to build an irrigation system. In 1902 President Theodore Roosevelt signed the Reclamation Act, and in 1906 the Sun River Irrigation Project was establish. After the irrigation project was started, Simms became primarily a grain and hay growing area. The town of Simms was named after Simms Creek, which flows into the Sun River, approximately one mile west of the town. The creek was named after a pair of brothers who were woodcutters along the Sun River in earlier days. The crossing on the location of the Sun River Bridge, located about 7 miles from Simms near the town of Sun River has been used for centuries. This had long since been the site of the Blackfeet Indian Government Farm, located about a half mile north of the existing bridge. In the early 1860s a military road was built through Montana utilizing portions of already existing trails travelled by generations of Native Americans. As the traffic along the route increased, a trading post was established to exchange furs and pelts with the Blackfeet. The construction of Mullan Road, the first wagon road to cross the Rocky Mountains to the Inland of the Pacific Northwest, and the discovery of gold in southwestern Montana made Sun River Crossing a heavily covered route. To take advantage of the traffic between the steamboat port of Fort Benton, nearby Fort Shaw and the gold camps of the Gallatin Valley, a toll bridge was created, along with several others just downstream soon after. The arrival of the railroad in Great Falls in 1886 did not diminish the importance of the Sun River Crossing and it continued to thrive until after 1900. The significance of this crossing can be upheld by the fact that the bridge and the community of Sun River still endure today. The Ranch has been very well managed for deer, upland bird, waterfowl and all wildlife. The current owner is an accomplished archery hunter and several Pope and Young whitetail and mule deer bucks have been harvested from the Ranch over the years. There is a well-established trail system to access the network of ideally positioned tree stands. For the avid archery hunter who has a passion for whitetails, there are few opportunities comparable to those offered to the owner of Three Buttes Cattle Company. Fishermen will be able to pursue healthy trout in the approximately 1.5 miles of the Sun River that flow through the Ranch. Controlling both sides of the river creates many opportunities to fish and travel easily along the river within the confines of the Ranch. This section of the Sun River features numerous riffles and deep pools that provide great habitat for trophy browns and rainbow trout. A private spring creek flows through the riparian area along the edge of Floweree Butte on its way to its confluence with the Sun River. This spring creek holds numerous large healthy brown trout that work their way up from the river providing an ultimate challenge for a spring-creek fishing aficionado. The vibrant fishing town of Craig, which is located right on the banks of the Missouri River, is only 35 minutes from the Ranch. The Missouri has a well-deserved reputation among fly fishermen as one of the premiere rivers in Montana and the entire United States. It offers world-class fly fishing in every month of the year and summer insect hatches bring in anglers from around the world. The Sun River, which originates in the renowned Bob Marshall Wilderness, flows into Gibson Reservoir. Gibson Dam regulates the River providing consistent flows through most of the summer months. Gibson Reservoir and Diversion Lake, located about 3.5 miles below Gibson Dam on the Sun River, are located northwest of the Ranch. These reservoirs contain rainbow and brook trout and Arctic grayling. Pishkun and Willow Creek Reservoirs, also in the Sun River drainage, offer the angler opportunities to catch large trout, pike and Kokanee salmon. After coursing through the Ranch, the Sun River continues southeast where it joins the Missouri River at Great Falls. Situated along the edge of the Pacific and Central Flyways waterfowl hunting is outstanding on the Ranch. The River corridor on the Ranch includes extensive spring-fed wetlands that combine with a natural spring creek that feeds into the Sun River creating a prime habitat for waterfowl, upland game birds and other wildlife. Significant populations of Hungarian partridge, pheasant and sharp-tailed grouse are observed throughout the Ranch. The proximity to neighboring irrigated grain fields provides upland birds a readily-accessible food source; this, along with the river bottom and wetland cover, creates an ideal habitat. The lush riparian thread along the River and other tributary streams combined with the grain crops and cover greatly enhances the quality and magnitude of wildlife which is apparent through the abundant numbers of whitetail, mule deer and antelope scattered throughout. Should upland birds be a priority for a new owner, the addition of some grain fields and food plots would expand the bird hunting opportunities. The Ranch is located in hunting District 444. For specific regulations and additional information please refer to the Montana Fish, Wildlife and Parks website at www.fwp.mt.gov. The outdoor amenities of North Central Montana are abundant, fulfilling the prerequisites of any recreation enthusiast. The Bob Marshall Wilderness Complex situated about 25 miles west of the Ranch is comprised of about 1,535,352 acres. “The Bob” is the fifth largest wilderness area in the United States. Its sustained beauty is due in part to the Wilderness Act of 1964 which prevents any roads or structures from being created, as well as no motorized or mechanical equipment allowed in the area. The Wilderness is accessible by foot or on horseback through its abundant trail system. Hunting, fishing and camping are all allowed with the proper permitting. Wildlife within the area includes all of the large North American mammals including grizzly and black bears, moose, elk, mountain goat, bighorn sheep, wolverine, mountain lions, bobcats and lynx. 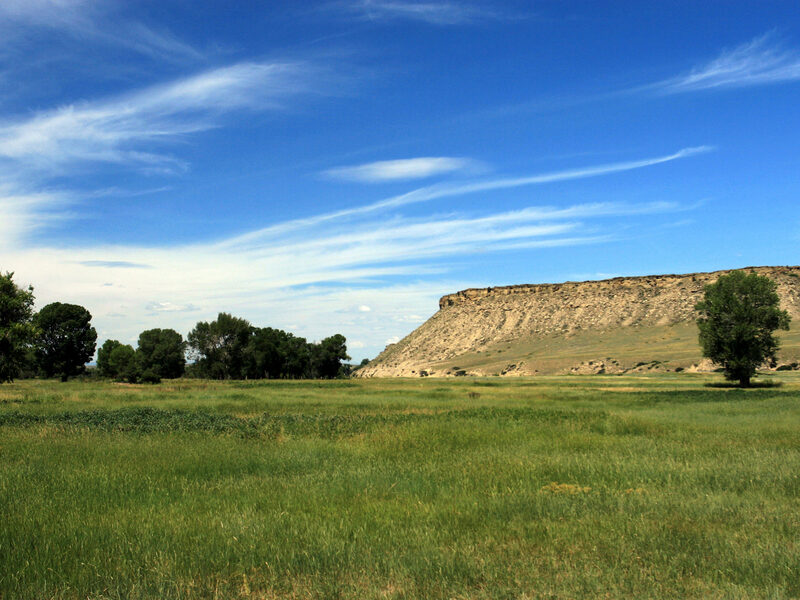 Three Buttes Cattle Company overlooks the Crown Butte Preserve, home to one of four buttes, three of which are visible from the Ranch, located in the area west of Great Falls. All four are laccoliths that were formed during a period of volcanic activity 50 million years ago. Erosion has worn away the overlying sedimentary rock, leaving remnants of the more resistant igneous formations. Although the most striking features of Crown Butte are the rising columns of rock and the wild grasses, the preserve also provides a rich habitat for wildlife. Just north of the Ranch, near the town of Fairfield, lies Freezeout Lake. While this Wildlife Management Area offers hunting, wildlife viewing, and the opportunity to iceboat in the winter, it is also the primary staging area for snow geese in their spring migration from the Gulf States. In early March as many as 300,000 snow geese and 10,000 tundra swans gather at the Lake to rest before continuing to the extreme northwest Arctic Coast of Canada. 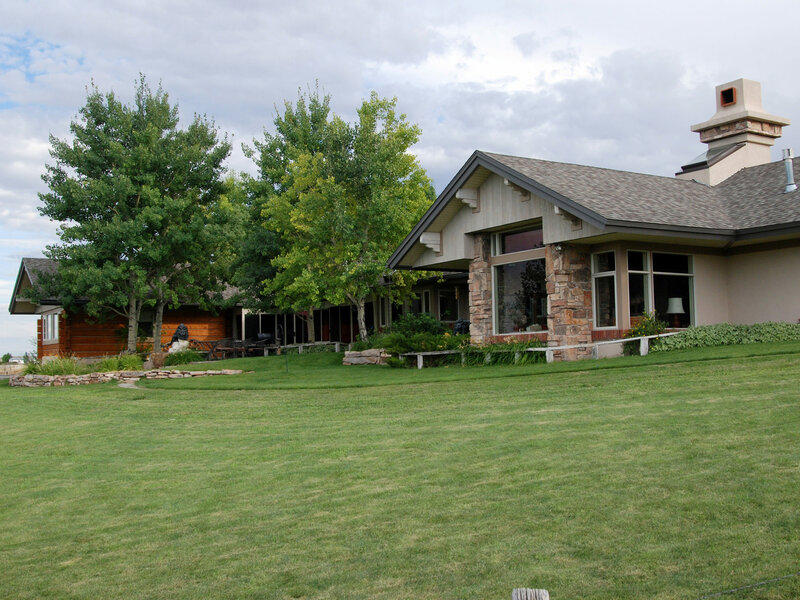 Golfing in the backdrop of the Rocky Mountain Front is available at the Choteau Country Club, Harvest Hills Golf Course in Fairfield and there are several notable public and private courses in Great Falls. There are also opportunities to see the inspirational rock formations and limestone cliffs along the section of the Missouri River below Great Falls. Scenic boat tours are available to enjoy the beauty of a river that has not changed appreciably since the days of Lewis and Clark. To gain additional knowledge of the “Corps of Discovery” Expedition and the history of the area, it is well worth visiting the Lewis and Clark Interpretive Center in Great Falls which offers lecture series, films and exhibits. Three Butte Cattle Company represents the opportunity to own a premium wing-shooting and big-game hunting ranch with very well-designed and maintained improvements and the ability to run a small cattle operation. The location along the Rocky Mountain Front provides access to some of the most dramatic terrain and views in the western United States. Whitetail hunting is exceptional in the river bottom and woods, while the rugged Floweree Butte offers outstanding mule-deer hunting. Anglers will appreciate controlling both sides of the Sun River for over 1.5 miles providing great fishing opportunities for trophy-size brown and rainbow trout. 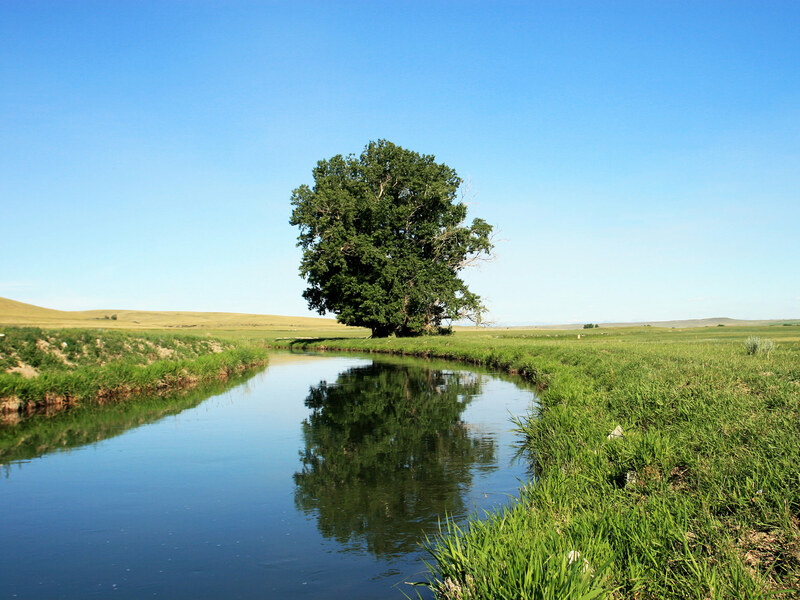 The private spring creek adds an opportunity test your angling acumen and also could provide an option to expand the wetland and fishery potential on the Ranch.